Posted in General Health & Wellness on October 23, 2011. Last modified on March 28, 2019. Read disclaimer. Doctor visits often play a crucial role in health outcomes, but this can be jeopardized by a poor doctor-patient relationship. In fact, the Institute of Medicine estimates that as many as 98,000 deaths may have occurred in US hospitals in 1999 because of miscommunication, patient misidentification and other errors in patient safety. Like any relationship, communication is key. But don't expect your doctor to do all the talking; remember that relationships are a two-way street. 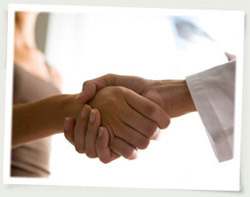 Below are some tips that can help you develop a solid partnership with your physician. Don't exclude any embarrassing details; doctors can deal with whatever you bring their way. The best way to get the information you need is to ask questions. If you don't understand something, ask the doctor to clarify it and/or rephrase it in a simpler way. To avoid miscommunication or forgetting details, it often helps to ask a friend or family member to join in your conversation with the doctor. Though you may be tempted to save questions for the end of the visit, it's easy to forget them, so ask as soon as they pop into your head. Ask questions about any prescribed medications: side effects, interactions and what to avoid while taking the medicine. If surgery or hospitalization are required, as how best to prepare and the surgery or treatment schedule. Also discuss which hospital or treatment center would be best for your individual needs. If treatment will be difficult, dangerous or costly, ask the doctor to list all treatment options available to you. Ask that you receive notice of your test or procedure results -- whether it's by phone, in person or in the mail. Just because you never heard the results, do not assume that everything came back fine. And if you have questions about the results, as for clarification. Confirm that your name and the medication printed on the bottle you receive are correct. If the medicine inside the bottle is different than what you are expecting or what you're used to, check with the pharmacist. It is possible that the prescription may have been filled incorrectly at the pharmacy. Read warnings and directions printed on prescription bottles. Everyone likes to hear they're doing well, and doctors are no exceptions. Let your physician know what he or she is doing right. Tell them in person, or send a note or email. Take it a step further and refer friends and family. Get the most out of your healthcare experience by taking those three simple steps to create a good patient-doctor relationship. You'll feel better about your visit and your doctor will, too! 4 signs that it may be time to cut the chord with your doctor? 1) Do you have confidence in their ability to diagnose and treat your problems? 2) Do you feel heard, respected and valued? Do you feel like you always leave without saying what you intended to? You're not alone; studies show that many physicians interrupt patients after about 20 seconds of explanation. If the doctor walks in the room, flipping through your chart, doesn't make eye contact, treats you like just another inconvenience in a hectic schedule, and doesn't appear to be listening to you, yes, it may be time to shop around. Does your provider keeps you out of your own health loop? Look for someone who explains tests, diagnoses, treatments, etc., in language you can understand, and discusses any necessary follow-up. 3) Does the provider accept your current health insurance? If not -- or if you don't have insurance, will their office work with you to adjust your charges or payment schedule? 4) Is the provider convenient? Is	it	easy	to	schedule	an appointment, are they located nearby, do their hours fit with your schedule, do they make you sit in the waiting room indefinitely? If you're not satisfied with your current health care provider, consider services like AngiesList for qualified referrals. I believe that, if a woman is unhappy with the medical service she's receiving from a male doctor, she should consider requesting a female doctor. Nothing against male doctors but I believe that, in some cases, women doctors may be better able to understand another woman's needs.